The PPRC identifies Pueraria (Ge Gen) as the dried root of Pueraria lobata (Willd.) ohwi (Fam. Fabaceae). The nature of Pueratia is cool, its flavor is sweet and acrid, and it homes to the Spleen and Lung channels. Its functions include resolving the flesh, abating fever, venting rashes, engendering fluids and resolving thirst, as well as raising the Yang and checking diarrhea. Pueraria is commonly applied for external pathogenic invasion with exterior patters, unexpressed rash and pox, heat illnesses with thirst, wasting and thirsting due to Yin deficiency, heat diarrhea and dysentery, as well as diarrhea due to Spleen deficiency. Pueraria (Ge Gen, 葛根) dispels pathogenic factors from the muscle and skin and promotes the generation of body fluid. Ephedra (Ma Huang, 麻黃) and Fresh Ginger (Sheng Jiang, 生薑) induce sweating, dispel wind-cold, and release the exterior. Cinnamon Twig (Gui Zhi, 桂枝) releases the exterior, relaxes the muscles, and warms the channels. White Peony (Bai Shao, 白芍) nourishes Yin and harmonizes Ying Qi. Both Cinnamon Twig and White Peony harmonize the Ying Qi and Wei Qi. Jujube (Da Zao, 大棗) and Backed Licorice (Zhi Gan Cao, 炙甘草) harmonize the middle warmer and strengthen the Spleen. Induces sweating, dispels pathogenic factors from the muscles and skin, and harmonizes the Ying Qi and Wei Qi. Traditional: Tai Yang (太陽) disease with an exterior excess pattern marked by chills, fever, no perspiration, stiffness and pain in the neck and upper back, body aches, with or without diarrhea, a thin, white tongue coating, and a superficial tense pulse. Modern: Upper respiratory tract infection, cervical spondylosis, chronic Rhinitis, tendonitis or bursitis of the shoulder, Bell’s palsy, early-stage excephalitis, hordeolum, mumps, and neuralgia. Notopterygium Root (Qiang Huo, 羌活) and Siler (Fang Feng, 防風) disperse dampness from the meridians and alleviate pain. Red Atractylodes (Cang Zhu, 蒼朮), White Atractylodes (Bai Zhu, 白朮), and Capillaris (Yin Chen Hao, 茵陳蒿) dry dampness and promote the Spleen’s transforming and transporting function. Scute (Huang Qin, 黃芩), Sophora Root (Ku Shen, 苦參), and Anemarrhena (Zhi Mu, 知母) clear away damp-heat. Polyporus (Zhu Ling, 豬苓) and Alisma (Ze Xie, 澤瀉) promote urination and leach out dampness. Chinese Angelica (Dang Gui, 當歸) activates the blood to alleviate pain. Ginseng (Ren Shen, 人參) and Licorice (Gan Cao, 甘草) augment Qi, strengthen the Spleen, and protect the Stomach from the damage caused by the ingredients with bitter flavor and cold property. Cimicifuga (Sheng Ma, 升麻) and Pueraria (Ge Gen, 葛根) disperse dampness and clear heat. Clears heat, eliminates dampness, tonifies the Qi and blood, and alleviates pain. Traditional: Damp-heat syndrome marked by a heavy sensation in the upper back and shoulders; fullness and congestion in the chest and epigastrium; general aching; swelling and severe pain in the legs and ankles; or skin lesion in the lower body manifested by itching, burning, and irritation. Modern: Eczema in the genital area, urticaria, allergic purpura, neurodermatitis or other types of dermatitis in the lower limbs, gonorrhea, arthralgia with swelling and pain, somatic swelling and pain, and beriberi scabies. Magnolia Flower (Xin Yi, 辛夷) blocks nasal passages and disperses wind-cold. Ephedra (Ma Huang, 麻黃) facilitates the flow of Lung Qi, and disperses wind cold. Gypsum (Shi Gao, 石膏) clears Lung heat. 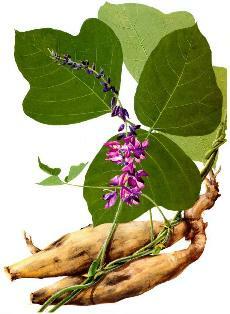 Pueraria (Ge Gen, 葛根) raises lucid Yang Qi, and releases the exterior. Platycodon (Jie Geng, 桔梗) facilitates the flow of Lung Qi, and promotes nasal discharge. Coix (Yi Yi Ren, 薏苡仁) initiates nasal discharge. The above-mentioned four herbs facilitate the flow of Lung Qi, release the exterior, and clear Lung heat. Rhubarb (Da Huang, 大黃) clears heat and activates the blood. Ligusticum (Chuan Xiong, 川芎) promotes the flow of the Qi and blood and assists other ingredients to release the exterior and clear nasal passages. Cinnamon Bark (Gui Pi, 桂皮) warms and unblocks the channels and assists other ingredients to release the exterior and clear nasal passages. The above-mentioned three herbs clear heat and activate the blood to assist other ingredients to release the exterior and clear nasal passages. White Peony (Bai Shao Yao, 白芍藥) nourishes Yin, harmonizes Ying Qi, and promotes Yin from the damage caused by the ingredients with pungent taste and dry property. Fresh Ginger (Sheng Jiang, 生薑) disperses cold and releases the exterior. Jujube (Da Zao, 大棗) strengthens the Stomach and harmonizes Ying Qi. Licorice (Gan Cao, 甘草) harmonizes the action of other ingredients. Ginger, Jujube, and Licorice strengthen the Spleen and Stomach and harmonize Ying Qi and Wei Qi. Facilitates the flow of Lung Qi, releases the exterior, clears heat, and unblocks nasal passages. Traditional: Obstruction of Lung Qi due to affliction of wind-cold and accumulation of Lung Heat marked by nasal congestion, discharge, decreased sense of smell, sneezing, headache, itching in the nose and throat, decreased energy level, and restlessness. Modern: Rhinitis, sinusitis, allergy, common cold, influenza, and sinus headache. Perilla Leaf (Zi Su Ye, 紫蘇葉) dispels wind-cold and releases the exterior. Ginseng (Ren Shen, 人參) augments Qi and strengthens the Spleen. Peucedanum (Qian Hu, 前胡) releases the exterior, directs rebellious Qi downward, and arrests cough. Pueraria (Ge Gen, 葛根) releases the exterior and relax the muscle. Pinellia (Ban Xia, 半夏) and Citrus Peel (Chen Pi, 陳皮) dry dampness, transform phlegm, and stop vomiting. Mature Bitter Orange (Zhi Ke, 枳殼) and Vladimiriae (Chuan Mu Xiang, 川木香) promote the flow of Qi and eliminate distention. Hoelen (Fu Ling, 茯苓) strengthens the Spleen and drains dampness. Platycodon (Jie Geng, 桔梗) facilitates the flow of Lung Qi and guides other ingredient upward. Licorice (Gan Cao, 甘草), Fresh Ginger (Sheng Jiang, 生薑), and Jujube (Da Zao, 大棗) strengthen the Spleen and harmonize the Stomach. Augments Qi, releases the exterior, expels phlegm, and arrests cough. Traditional: Affliction of wind-cold with phlegm accumulation marked by fever, chills, headache, nasal congestion, cough with profuse phlegm, fullness and distention in the chest and epigastrium, a white tongue coating, and a superficial pulse. Modern: Common cold, influenza, or bronchitis in the elderly, children, or people with weak constitution; toxemia during pregnancy; hangover; and mild depression.